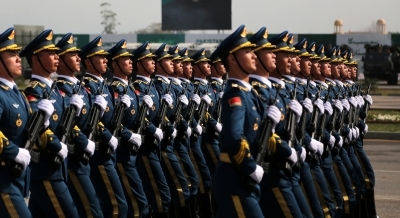 Beijing, July 30 (IANS) A first-ever Army Day parade began at a military base in Inner Mongolia region on Sunday to mark 90 years of the founding of China’s People’s Liberation Army. The parade is taking place at the Zhurihe military base, Xinhua news agency reported. Formations of conventional missiles, nuclear missiles and missiles for both nuclear and conventional strikes were displayed to show the country’s capacity of deterring, fighting, restraining and winning battles. All vehicles on the ground carried three flags — that of the Communist Party of China (CPC), the state and the military. President Xi Jinping inspected the troops standing in an open-roof jeep. He said the CPC and the Chinese people all take pride in the PLA. “History has proved that the PLA is a heroic force that has followed the Party’s command, served the country with loyalty, and fought for the great rejuvenation of the Chinese nation,” Xi said. “The Party and people of all ethnic groups in China take great pride in having such a heroic army,” he added. The PLA was founded on August 1, 1927, during the Nanchang uprising against then-ruling Kuomintang party. The later civil war resulted in founding the People’s Republic of China in the mainland China on October 1, 1949.